While there is Chinook salmon fishing year round on the Queen Charlottes (Haida Gwaii), we start our season in late May and end it in early September to ensure our clients maximize their chances of catching their limit of these fine beauties. Bottom fish, such as Halibut, Ling Cod, and Red Snapper, are here year round. May – Chinooks usually show up in numbers by the 15th of the month. Average weights run around 20 to 30 pounds with the odd 40 or 50 pound fish around. While there are no Coho, Halibut fishing for chickens in the 20 to 40 pound range can be good, with a few big momma Halibut swimming the flats. 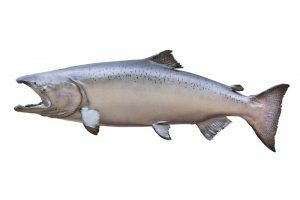 June – Chinook numbers continue to build through early June to a peak mid month. During this time we start to see more big fish in the 40+ pound range, as well as the normal 25 to 35 pounders. These fish usually hang out for 3 weeks to a month, depending on weather and bait to hold them here. The first Coho of the year start to show in numbers around the third week of the month and average 6 to 9 pounds. Halibut fishing for chickens in the 20 to 40 pound range is normally good. Although not our primary target, Pink Salmon, with an average weight of six pounds, arrive to provide action between Chinook bites. 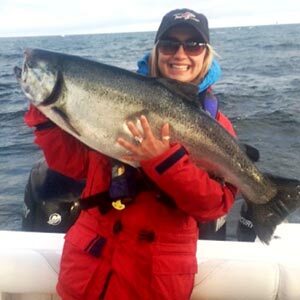 July – Chinook fishing remains strong with a good number of 30+ pound fish available. Coho normally show up in big numbers early in the month. Voracious feeders and spunky fighters, the Coho now average 8 to 11 pounds. Halibut fishing usually picks up mid month and can be very good for chickens in the 20 to 40 pound range. August – Lots of Chinook still around with the average size improving as many runs go by our fishing grounds on the way to their natal streams to spawn. A run of larger fish usually shows up very early in the month and stay for 2 to 3 weeks. Coho fishing is still good with increasing size and the odd fish in the high teens. Halibut fishing will get stronger and the size will get bigger as the Halibut target Coho. September – Chinook fishing will slow down now, but we usually get a small run of trophy sized Chinooks in the first week that will not be here long. These are fast moving schools that will vanish after the first big rain. This is when we get our biggest Coho, up to 20+ pounds. Halibut fishing is also good, both for chickens and big mommas. One thing about salmon fishing the north coast of the Queen Charlottes, every day out on the water an angler has a chance of catching that trophy fish. We have been in operation for over 15 years and have seen 50+ pounders caught on the first day of the season as well as the last. You never know when the “Big Guy” will hook up on your line.